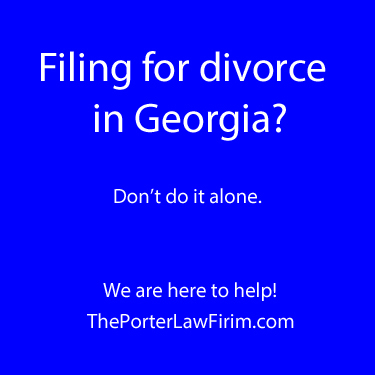 How do I file for divorce against my spouse in Georgia? When you said “I do”, you thought it was forever. You vowed to never even mention the word divorce. At some point, the honeymoon ended. Things have gone from bad to worse. Now, divorce is imminent. Besides the emotional turmoil, you have no clue where to start in the legal process. This article is a great place. In Georgia, unlike many other states, there is not a waiting period for filing a divorce. With a good attorney, you can oftentimes file the same day you decide to start the process. How much does it cost to file for divorce in Georgia? It costs around $207.00 to actually file for divorce. This cost is called the filing fee. Where do I file for divorce in GA? The divorce suit is typically initiated in the county of residence where you live. In order to file in Georgia, you must show that you have been a resident of the state of Georgia for at least six (6) months prior to filing. It does not matter where you got married. What paperwork do I need to file for divorce in Georgia? To file, you will need to draft a Summons, Complaint for Divorce, and Domestic Relations Financial Affidavit (DRFA). The Summons is a document that informs the Defendant that he must file an answer within 30 days. The Complaint for Divorce is the legal document where your claim for divorce, including your requested relief, is set forth. The DRFA is a four-part financial document requesting information to be supplied under oath about your earnings, expenses, assets, and liabilities. If minor children are involved in the divorce, you will need to submit a Child Support Worksheet for filing as well. These papers are all filed in the clerk’s office along with the payment of roughly $207.00. Unless your ex searches on the county-specific website, he will not know that you have filed for divorce until Step 2. This step requires you to inform your ex that you are suing him for divorce by formally giving him copies of the documents listed in Step 1. It may be done in four (4) different ways. First, you can pay the sheriff’s office in his county of residence $50.00 (or a different amount if he lives out of state) to have him served. A sheriff will come to his residence or place of employment and attempt to serve him. They will not go out at particular days/times, and only try about three (3) times. If they are unable to get him served, you will need to try another option, and your payment is not refundable. Second, you can hire a special process server to have him served. The cost of this option varies depending on your ex’s address, whether multiple attempts are needed, and whether you need him served quickly (within 48 hours), but typically costs around $65.00-$85.00. The benefits to selecting this route include selecting the precise date/time to have him served, and avoiding the necessity of a uniformed officer coming to your home or his place of employment. Third, you can ask that your ex sign an Acknowledgment of Service. This is a one-page document that satisfies the service requirement if it is signed by your spouse and filed in the clerk’s office. The form can be sent to your ex by your lawyer, handed to him by you, or anyone else so long as it is provided with the above documents and he signs and returns it. Fourth, if your spouse’s whereabouts are unknown and cannot be ascertained despite a diligent search, you can serve him by publication. This step can only be done if you cannot locate your spouse. It costs around $80.00. An advertisement is taken out in the county’s legal newspaper, and must run for four (4) consecutive weeks to satisfy the service requirement. Step 3: Discovery, Settlement, Mediation, Etc. Every divorce is different. Depending on the complexity of your case, after filing and getting your spouse served, it may be time to send a formal offer of settlement for your spouse’s consideration. However, many times, the case is not yet ripe for negotiations. What if you do not know the balance of your husband’s 401k? Or the payoff balance on the house? Or how much he has in his bank account? Before attempting to settle your case, it is imperative that you have gotten this information and much more. The Courts allow you six (6) months after the Defendant is served to engage in the discovery process. You have the right to send your spouse questions or request documents. He will have thirty (30) days to respond. You can also take his deposition, send subpoenas to non-parties, and take other actions to fully discover the information critical in your divorce. Once you have learned the necessary information, you can send an offer for settlement and/or schedule and attend mediation. Most counties in Georgia require mediation before a final divorce trial. If your case cannot be settled, it is imperative that you schedule a final hearing as soon as the case is ripe for disposition. Many courts will not have availability for sixty (60) to ninety (90) days after the request is received. Please note that this guide is merely a starting point on how to file for divorce in Georgia. It is important that you seek the assistance of an experienced family law attorney to walk you through the twists and turns of a divorce. If you wish to learn more about how your case can be handled by my firm, please call for your free 30-minute consultation. Benjamin Porter is a Partner with The Porter Law Firm, L.L.C. 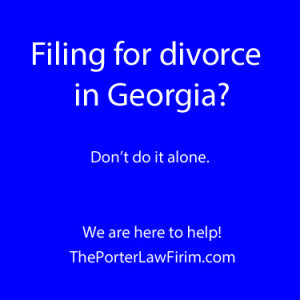 How to file for divorce in Georgia was last modified: December 14th, 2013 by Benjamin Porter, Esq.